Feta is a white-brined curd cheese traditionally made across the Eastern Mediterranean basin the roots of which can be found in Greece. It is a crumbly aged cheese, commonly produced in blocks, and has a slightly grainy texture. Feta is used as a table cheese, as well as in salads (e.g. the Greek salad), pastries and in baking, notably in the popular phyllo-based dishes spanakopita ("spinach pie") and tyropita ("cheese pie"), or served with some olive oil or olives and sprinkled with aromatic herbs such as oregano. It can also be served cooked or grilled, as part of a sandwich, in omelettes, or as a salty alternative to other cheeses in a variety of dishes. Since 2002, feta has been a protected designation of origin product in the European Union. According to the relevant EU legislation, only those cheeses produced in a traditional way in some areas of Greece (mainland and the island of Lesbos), and made from sheep's milk, or from a mixture of sheep and goat's milk (up to 30%) of the same area, may bear the name "feta". However, similar white brined cheeses (often called "white cheese" in various languages) are found in the Eastern Mediterranean and around the Black Sea. 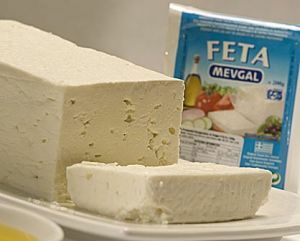 Similar brined white cheeses produced outside the European Union are often made partly or wholly of cow's milk, and they are sometimes called "feta". Feta is a Greek soft white-brined cheese with small or no holes, a compact touch, few cuts, and no skin. It is usually formed into large blocks, which are submerged in brine. Its flavor is tangy and salty, ranging from mild to sharp. Its maximum moisture is 56%, its minimum fat content in dry matter is 43%, and its pH usually ranges from 4.4 to 4.6. Feta is traditionally categorized into "firm" and "soft" varieties, the former being tangier and considered of higher quality; the latter is so soft as to be almost spreadable, and is mostly used in pies, or where its cheaper price is a factor. When sliced, feta always produces a varying amount of trímma, "crumble", which is also used in pies; trímma is not sellable and is usually given away for free upon request. High-quality feta should have a creamy mouth-feel, and aromas of ewe's milk, butter, and yogurt. In the mouth it is tangy, slightly salty, and mildly sour, with a spicy finish that recalls pepper and ginger, as well as a hint of sweetness.